We feel a little bit like Ffoton Wales Royalty with more interest coming our way in the form of an exhibition at Little Man Coffee in Cardiff the venue for Ffoton's first exhibition featuring work by non other than Eleri Griffiths if you happen to be in Cardiff during the month of October pop along for a brew and take some time to look at the work by photographers who have features in this years Ffoton podcasts. The exhibition also includes work by Matt Botwood, Dan Wood and Rebecca Thomas and run along side Diffusion Festival which sees emerging and established photographers showing their work in venues across Cardiff and beyond. Recently Paddy and I have been lucky enough to speak to Ffoton Wales about our independent practice and joint ventures. Thanks so much to Brian Caroll and Emyr Young for taking the time to speak to us making the whole interview experience such a pleasurable one. Well we both attended the opening preview of the Mostyn Open 19 exhibition on Friday 13th March. The event was well attended with many of the 40 selected artists present. It was great to see photography so well represented in such an important venue though tragically I failed to win the £10,000 prize! The exhibition is on until July 5th. Just received a beautiful photo-book by a highly respected and talented photographer. #ZedNelson. "A Portrait of Hackney" from #HoxtonMiniPress is a beautifully produced sequence of images looking at the everyday nuances and highlights of the humdrum life in Hackney. There is a lovely range of books available from this small independent publishers. Thank's to Bob for such a lovely thoughtful gift and do take time to check out Zed's fantastic work at www.zednelson.com and also the beautiful range of publications at www.hoxtonminipress.com. I love animals and therefore adore the work of the photographer Tim Flach. He's arguably one of the most accomplished animal photographers in the world. His unique studio portraits of domestic and wild animals are beautifully observed and expertly captured. Of course it's only natural to emulate those who inspire us, 'Imitation', as they say "is the sincerest form of flattery". 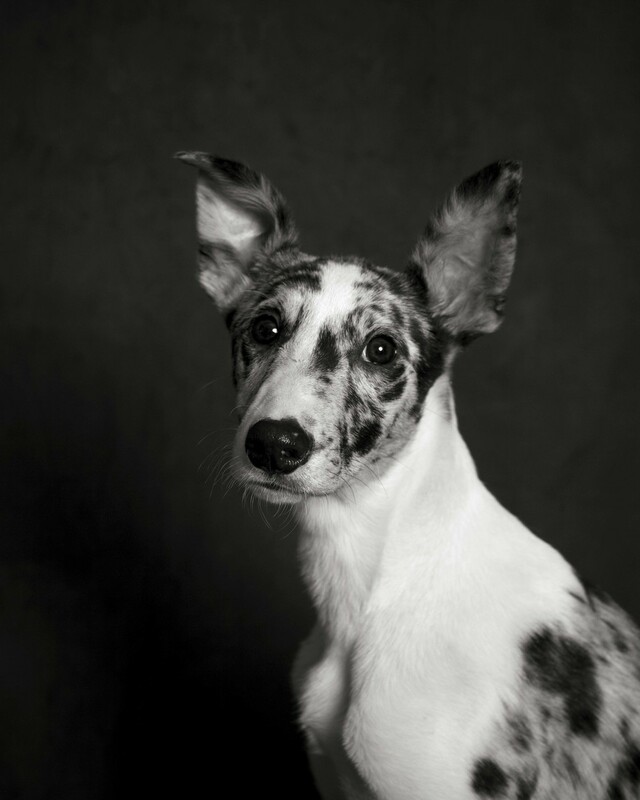 Today we had the opportunity to photograph a beautiful whippet-cross puppy, Her name is Bo (or Beaux or Beau) and she had the most expressive eyes - and ears too! We hope to be able to photograph Bo as she grows but for the time being, here she is at four months old. A few weeks ago, while browsing in an antiques shop, we came across a victorian postcard stand. we had to haggle over the price, but managed to secure a deal and brought the stand home with us. After a little bit of research we found the stand had been made for a postcard business dating back to the late 18th Century. Raphael Tuck became famous amongst other things for the manufacture and distribution of postcards; apparently the first was made in 1894 and depicted a view of Snowdon in North Wales. Rather than try an explain the history of Raphael Tuck, we will simply direct you to the website about the Tuck Postcard Empire. Sadly there were no postcards left in the stand, so we've been having enormous fun printing out our photographs to fill the display. Raphael Tuck Postcard stand, tilt and Shift Gallery. LLanrwst. If you want to learn some more about Tuck, you can follow this link to find out a little more. We also managed to find one of Tuck's postcards of our favourite landmark in Llanrwst. Gwydir Castle, home to the famous Wynn dynasty. I've started working on a new project recently as a result of re-visiting some old digital files. A few years ago I embarked on a rather ambitious project to take a photograph every day for one year. Even though I was working as a full time photographer it was much harder than I imagined. I actually only managed a couple of months before creative fatigue set in and I gradually ground to a halt. Forcing creativity at the end of a long working day in the middle of winter took it's toll but the discipline of carrying a camera with me at all times during those few months meant I still managed to produce some interesting images. Returning to a piece of work allows you to view it with a new perspective, a fresh pair of eyes as it were. Rather than viewing the photographs as a failed project I realised there was an opportunity to create a new body of work using some images taken during these cold winter months. It serves as a reminder of my time spent in Cornwall while studying for my Masters Degree in Falmouth. Living near the cost it was possible to spend days at a time shrouded in fog. Unlike mist which can make a landscape appear romantic, fog, distorts the horizon, hides the truth and projects feelings of unease or even fear. Uncharacteristically, I'm looking forward for a change to the winter months in order to pursue some Ghost Weather. Here is our new window display after our gilt-framed cyanotypes. The giant prints (there is one facing into the shop as well) were made by the marvellous Paul Flohr at the Thinc Digital Imaging Centre at Coleg Cambria in Wrexham. Highly recommended service if you want large scale prints at very reasonable prices with an excellent cup of coffee as well! College facilities are much undervalued and underused so support your local College! We're excited about the latest edition to the family. Years ago I had a MPP 5"X4" field camera, ( this refers to the size of the negative) bought for me by my parents. I was too poor just to splash out, so when this new fangled digital technology came along, I needed something I could trade-in in order to buy a good digital camera which was and still is an essential party of a jobbing photographers kit. I didn't use the 5x4 camera much, and when I did, it seemed that film was too expensive and access to a suitable enlarger for making prints was difficult. So, I bid farewell to the MPP, and said hello to my first mega-pixel camera. 10 years on, and we're back with the 5x4! Perhaps if I'd have known then how expensive digital photography can be I would have clung on to my original film camera and saved myself the heartache. The cost of memory cards, computer hardware and software against film, chemicals and paper seem negligible. Of course I use a digital camera, it's just that it doesn't quite have the same charm. Using a vintage camera is like driving a vintage car. People will doff their caps, raise their eyebrows, point, stare, reminisce and engage you in conversation. To commemorate her maiden voyage as a member of the Tilt & Shift family, here are some digital photographs! 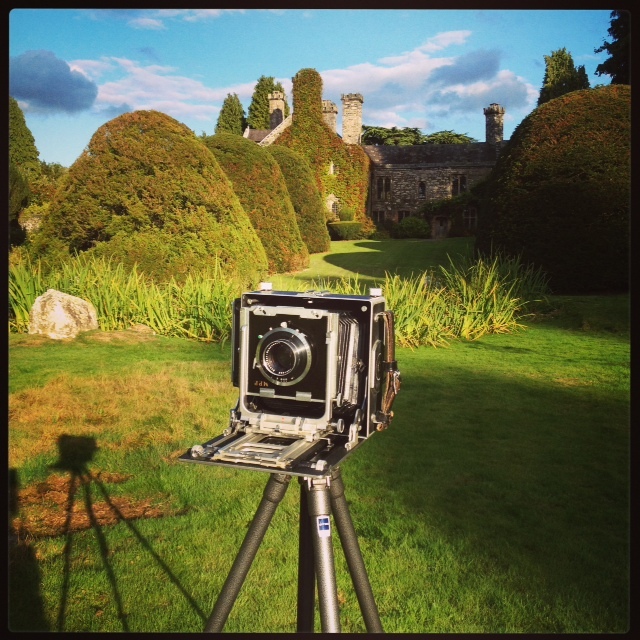 In the grounds of Gwydir Castle, on a beautiful August evening 2014. Dogs not quite so impressed. Well, another busy day at Tilt and Shift. Lel has been making contact prints of monochrome negs from our lovely Bronica 645 and I have been making prints for bromoil - first attempt at this process so will see how it goes. Lel's contacts are seen here drying and my bleach-tanned prints are seen in the sink washing before fixing and washing again. Here I am at Tilt and Shift busy preparing a new batch of 'blue' as Walter White would have it. No not meth, but cyanotype mixed from ammonium iron citrate (green) and potassium ferricyanide. This batch will make 400ml of cyanotype when the two parts are combined. Will post some results as soon as possible. 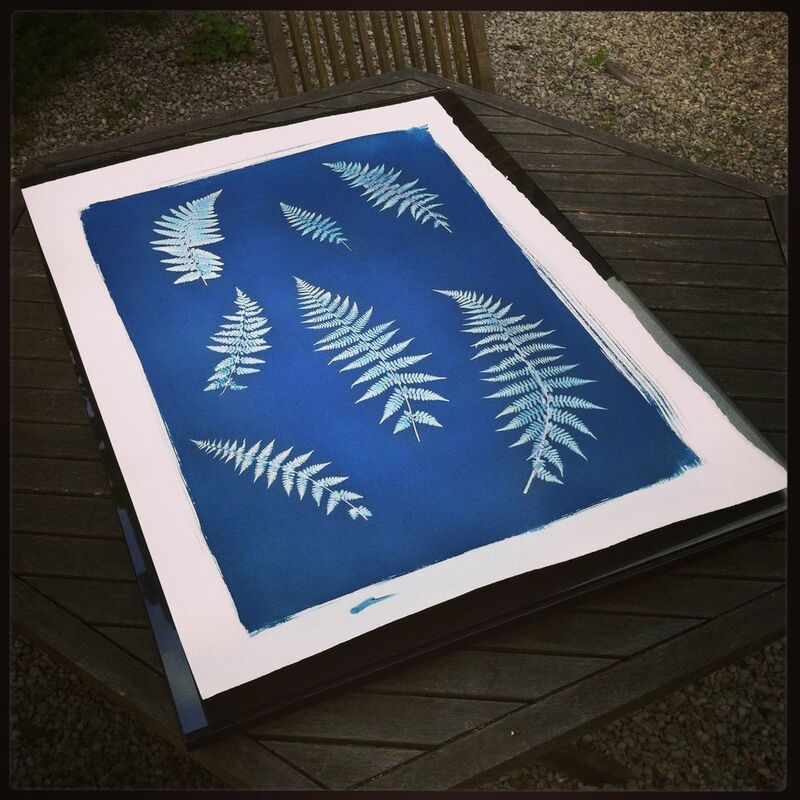 Lel has been working on some large scale cyanotype photograms of ferns in homage to Anna Atkins who published Photographs of British Algae: Cyanotype Impressions in 1843 (widely regarded as the first photographic book). The paper is Arches Platine with cyanotype mixed by myself from raw chemicals supplied by Silverprint in London. The paper size is 17"x32" and they are exposed in sunlight for times varying between two and twelve hours. They are all individual prints i.e. we don't make digital negs to contact print so they are true "one-off" prints. They will be available for purchase soon! A few weeks ago I blogged about collecting material to make some anthotype prints. The first batch of prints are finished and I'm really pleased with the results. I used a combination of spinach juice and and vodka which draws out the light-sensitive chlorophyl in the plant matter. I’ve heard the weather forecast is for sun this week, a little optimistic no doubt, but this has prompted me to try a new anthotype recipe. Last night I spent the evening peeling onions for their skins. Boiled up, onion skins produce a beautiful, amber coloured liquid, and after straining through a coffee filter I’m now in the process of coating some more paper. I’ll probably try a good few layer of brushing and drying before clipping the contact prints into frames and leaving out in the sun for as many hours or days it takes for them to fade. Tonight we’ll be eating french onion soup with croutons and grated Gruyere cheese; tomorrow is caramelised onion and goats cheese tarts. If you can think of any more onion recipes please do get in touch, I’ve got enough onions peeled and ready to cook that will see us through July and probably most of August! I have a plan for all of the anthotypes I'm making at the moment which will be revealed in the fullness of time, but for now, here's a few of the spinach images. I was at the fantastic open day at The Grange in Shropshire last weekend representing the Gwydir Press and our first hand-bound, letterpress book Pwyll-Prince of Dyfed. I met John Purcell of John Purcell Paper there and found fantastic 'paper' that inspired me to make abstract, large scale cyanotype test pieces. These will eventually become platinum prints once I sort out a working method. This is me making the very first test print at Gwydir on hand -coated Arches Platine paper; the print is approximately 110cm x 80cm. It's not what I want as I didn't expose it for enough time but I will get there! You can see the proper blueprint here on our Facebook page; ihatesocialmedia. I recently came across a post on Facebook from Geoff Wedge, a friend, fellow photographer and graduate from the Documentary Photography course at the University of Wales, Newport. Even though we graduated from the course almost 10 years ago, the words in this speech still ring true. With social media offering every opportunity to keep tabs on the achievements of your friends, colleagues, mentors rivals and even your enemies! While doing this, it's hard to maintain ones integrity when it comes to your own creative practice. Watching this clip of the young American photographer Ryan McGinley's speech to a group of graduating students from the Parsons School of Design, posted by Vice Magazine on YouTube, prompted me to think of some of my own fears and misgivings about producing and showing my work. Creativity is subjective, some people will like your work and others just don't get it. No Matter! Plough your own furrow and believe in your own creativity, use the unique experiences of your own life to open a visual dialogue with others. Enjoy your own perspective on the world. Plough your own furrow, to me this mantra sounds familiar but how many of us actually have the courage to do this. For those who need a little more encouragement and a sprinkle of reassurance it's worth digging into the Guardian Newspapers archive. On the 23rd of February 2013 Oliver Burkeman wrote an article that eludes to pretty much the same thing, his feature, Helsinki Bus Station Theory stresses the need for individuality. While is important to gain perspective by examining other peoples work, we should not be scared of our unique perspective of the world, but instead utilise it, embrace it, even exploit it as it's you unique selling point. Dave has an exhibition at the Emporium Gallery in Lichfield which opens on August 30th. Aside from his gargantuan efforts in making the photography courses at Staffordshire University some of the best in the UK, he also continues to photograph - and believe me, as an ex-teacher I know exactly how hard this is to do. Hopefully, we will be able to convince him to let us exhibit some of the images here at Tilt and Shift. So, 'Hats off' to Mr Noble and we very much look forward to seeing you there! I'm excited at the moment by the new growth. I took my usual early morning walk through the Gwydir forest with our two dogs, and could no longer resist the temptation to start plucking at leaves to press. I brought the foliage back to the studio and have pressed them in a beautiful vintage flower press. When they are properly flat and dry I'll be able to use them for photograms. Some of the earliest photographers employed this method of contact printing. A selection of foliage from the Gwydir forest, ready to be pressed. If your interested in learning about cyanotypes as an alternative print process there are plenty of You Tube video tutorials and specialist websites out there. But I am going to champion one photographer in particular. Anna Atkins was one of the earliest pioneers of the process, hugely accomplished and frequently over-shadowed by her contemporaries, such as Fox Talbot (they were in fact good friends) and John Herchel. Anna mastered the art of cyanotype printing and self-published her work in 1843 in a book entitled Photographs of British Algae: with hand written notes it was considered the first book of photographic images to have been published. So there we are, a little bit of photographic history and possibly something to aspire to! You know how every now and again you fancy a change, well we did, and this is what happened. Tilt & Shift, Photographers workshop and Gallery Llanrwst. North Wales. I have recently returned from a trip to Cameroon where I spent three weeks working on a photographic project with women beekeepers in the North West of the country. The trip was funded by the Joan Wakelin Bursary which is administered by the Royal Photographic Society in partnership with the Guardian newspaper. I was fortunate to be awarded the bursary in 2013 and attended the award ceremony in London accompanied by Paddy, of course. I was honoured not only to have received the award but to have spent the evening in the presence of some great photographers such as Brian Griffin, Peter Fraser and Giles Duley. If you are not familiar with these names, I recommend taking a look at their work. While I was merely the recipient of a bursary to help me on my way, these photographers, quite rightly, were collecting awards for significant achievements and outstanding bodies of work. It was my second attempt at applying for the award. I was shortlisted in 2012 but narrowly missed out on that occasion. Putting a proposal together is both difficult and time consuming; writing can be hard work if you are not gifted with words. Photographers tend to prefer visual communication but are often asked to submit lengthy essays to accompany images. It’s also difficult to engage fully without knowing the funding is secure, asking people for help as I did with both my contacts here in the UK and Cameroon, to invest their own time and energy helping you develop your idea when it may never happen due to lack of funding requires commitment from all sides. Thankfully on this occasion everything went according to plan, and I'm looking forward to seeing the work published soon. So here's a photograph of me at the awards, for those of you who don't know me I'm on the far right hand side of the frame front row. Photographers don't usually enjoy being photographed, but I'm so pleased to have been captured here with a distinguished bunch of like minded and enormously talented people.